Fly into Sydney and be personally met at the airport by a DISCOVER AUSTRALIA representative and transferred from the airport to the Indian Pacific railway station to begin your journey to Perth. Your epic journey from Sydney to Perth takes you along the longest stretch of straight railway track in the world, it's a journey of contrast encompassing some of Australia's most beautiful and diverse landscapes including the magnificent Blue Mountains and the vast empty expanse of the Nullarbor Plain. See below for full details on your Indian Pacific journey. 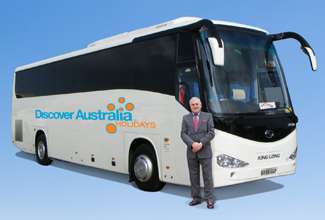 Note: passengers embarking in Adelaide join on Day 2. As the Indian Pacific arrives into Perth on day 4, you can sense the laid-back pace of this beautiful city fringed between the Indian Ocean and Swan River. You will be transferred from the railway station on arrival in Perth to your hotel. You can relax and use the rest of the day to explore your hotel and its facilities, perhaps take a stroll around the neighbourhood and central Perth. 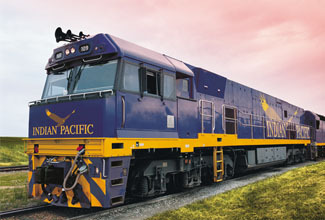 Meet and Greet Personalised Arrival Transfer, 3 Nights Gold Service Cabin on the Indian Pacific (2 Nights ex Adelaide), 3 Breakfasts, 3 Lunches, 3 Dinners, Luxury Broken Hill Coach Tour, Luxury Adelaide Coach Tour (Sydney to Perth customers only), Transfer to Perth Hotel, Overnight Perth Accommodation. The beautiful city of Perth is fringed by the Indian Ocean and the Swan River. It has spectacular beaches, a friendly welcoming ambience and a laid back lifestyle dominated by its seemingly perpetual sunny climes. Chic and stylish, Perth effortlessly combines this beach-outdoor lifestyle with its modern, urban big-city feel. You'll marvel at the spectacular cityscapes from beautiful Kings Park and enjoy the balmy waters of the Indian Ocean at the world-famous Cottesloe beach. Fremantle's historic colonial streets pulsate with the energy of street-performers and buskers, couples walk hand-in-hand through its colourful and lively markets. The lively street cafes and restaurants along its famous 'cappuccino strip' are perfect resting places to indulge in a spot of people watching. Today we combine the amazing natural wonder of the Pinnacles Desert with the unique living history of the 170 year old Spanish Benedictine enclave of New Norcia. We see Guildford and the fertile Swan Valley en route to New Norcia for a special guided tour of Australia's only monastic town, including the monk's shop for some famous New Norcia nut cake and breads. Visit a Wildflower Farm, the lobster fishing village of Cervantes and enjoy a gentle stroll through the mystical limestone pillars of the Pinnacles Desert. Tour north through the historic and charming Guildford, onto the Swan Valley (Western Australia's first wine growing region) and stop at New Norcia for a private guided tour (including buildings not accessible to the public documenting the order's history in Australia since 1846). See New Norcia Museum and Art Gallery (a piece of Spain comes alive, find extraordinary artefacts dating back to when New Norcia was an Aboriginal mission, historic wheatbelt farming techniques), New Norcia Abbey Church (home to one of only two large Moser organs, originally crafted in Germany) and St Gertrude's College (a grand gothic style building which was originally built as a girls boarding school and opened in 1908). Enjoy morning tea, then visit the Benedictine Community produce shop for the chance to purchase hand crafted goods including olive oil, fruit, wine, New Norcia nut cake and breads. 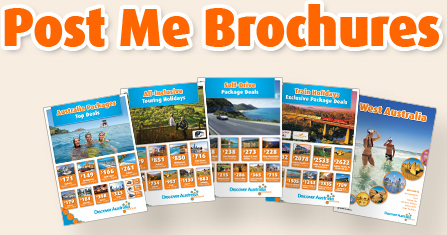 Tour through the southern suburbs of Perth, through the Peel Region and onto Busselton. Stop to see the longest wooden jetty in the Southern Hemisphere, stretching 1.8km across the peaceful waters of Geographe Bay. Tour through the Margaret River Wine Region and onto a premium local microbrewery for your indulgent Special Lunch in magnificent surrounds. Enjoy the flavoursome Special Lunch created from fresh local produce accompanied with beer tastings from this craft brewery. Take a guided tour through the Gothic like Mammoth Cave with vast chambers full of amazing formations (revealing fascinating facts about the flora and fauna of this region). Be awestruck at the size of the massive Karri trees at stunning Boranup Forest (over 100 years old, stretching for kilometres, pale barked Karri trees up to 60 metres tall). Visit Cape Leeuwin Lighthouse, the meeting point of the mighty Southern Ocean and the massive Indian Ocean, the most south westerly tip of Australia. Visit one of the many respected wineries to taste some of the very best wines and to gain an insight into the local winemaking industry. Stop at the quaint and bohemian Margaret River Township (unique specialty shops featuring craftwork created by locals, chic cafes). Head back to Perth with a deep appreciation of this world-class wine region and understand why it's such a popular destination. You will be personally met by a DISCOVER AUSTRALIA representative and transferred from Sydney airport to the Indian Pacific railway station to begin your journey to Perth. On arrival in Perth you will be transferred to your Perth hotel. You will be met at your hotel by a DISCOVER AUSTRALIA representative and transferred to the Perth airport for your flight home. The Indian Pacific to Perth All-Inclusive with Wildflower Discovery is very popular. Many dates book out well in advance, please book soon.